CLEVELAND (AP) — The losing has slowed, but hasn’t stopped for the ever-rebuilding Browns. They’re in the midst of yet another coaching search, and the NFL playoffs are likely to come and go without them again this season — the 16th straight postseason since their most recent appearance. But as Cleveland hit its bye week, and with six games left in another season going nowhere, optimism abounds around a franchise that has had little to celebrate over the past 25 years. The dark days of despair are dwindling. Baker Mayfield is making them go away. The fearless rookie quarterback with the contagious personality, touchdown-making skills and trash-talking bravado, has the Browns — and their long-suffering fans — believing. The No. 1 overall pick in this year’s draft, Mayfield is changing the Browns (3-6-1) with his actions on and off the field. He’s already endured years of chaos in just 10 games as Cleveland has changed coaches, traded its top playmaker (Josh Gordon) and leading rusher (Carlos Hyde), suffered numerous injuries and a few of those punch-in-the stomach losses that the Browns have seemingly mastered. But every time the Browns have taken a hard hit, Mayfield has responded with one of his own. Mayfield, who has gotten better every week, hasn’t won the respect of his teammates. He’s earned it. The Browns didn’t hand the starting job to Mayfield, who began the season in a backup role before starter Tyrod Taylor suffered a concussion in Week 3 against the New York Jets on national TV. Mayfield came in and led the Browns to their first win since 2016, snapping a 19-game winless streak and providing a preview of bigger things to come. It hasn’t been perfect so far. Mayfield has made his share of rookie mistakes, forcing passes, holding onto the ball too long, missing open receivers. But in the past four games, Mayfield has completed 69 percent of his passes with nine touchdowns and just two interceptions. Despite winning the Heisman Trophy and going 33-6 as a starter at Oklahoma, Mayfield wasn’t considered the top prospect in this year’s ballyhooed rookie QB class, which includes Sam Darnold, Josh Rosen and Josh Allen. Mayfield was too short, too cocky, too much a product of Sooners coach Lincoln Riley’s system. Well, Mayfield has outperformed the other rookies across the board. Last week, after being encouraged by interim coach Gregg Williams and his teammates to “cut it loose and play,” Mayfield delivered the signature performance and victory of his fledgling pro career. He completed his first 13 passes, finished 17 of 20 with three touchdown passes and outplayed Atlanta quarterback and 2016 NFL MVP Matt Ryan as the Browns ended a four-game losing streak with a 28-16 win. Following the game, Mayfield smiled and said he woke up “feeling dangerous” before de-feathering the Falcons, who had their playoff hopes severely shaken. The comment might have come off as cocky to some, but it was Mayfield at his playful and bragging best, displaying the swagger that made him a college superstar and has endeared him to his Cleveland teammates. 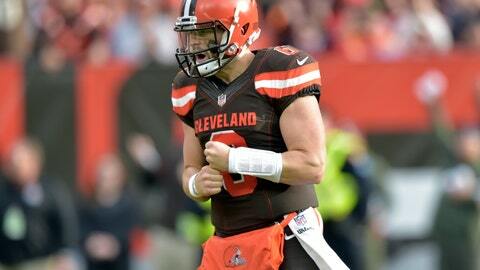 Make no mistake, at 23 and only 10 games into his NFL life, Mayfield is the Browns’ undisputed leader, the tone-setter. “He’s taken the role head-first, never looking back,” said rookie running back Nick Chubb, who rushed for 176 yards in the win. “He brings that energy and burst that we need. This team will follow him anywhere. He is just a great leader, and you know no matter what is going on around us or outside noise just the bad stuff that has not gone well for us, he is going to give us all 100 percent and he is not going to let it affect him. The praise from Chubb and others fuel him. In Cleveland, things are getting a lot better.